In his "Rajah's Birthday," where his impression of Indian sunlight at midday is not only radiant but quite near to the spectator, transfiguring objects in the foreground, his gamut of colour is unstrained, and his handling everywhere is free, ample, and joyous. There is not a trace of tired manipulation. The blaze of light being intense, your eyes do not at first resolve the plots of colour into the merry scene which they represent; but presently the many-tinted figures in the crowd, emerging one by one from the sunshine, begin to jostle around the great elephants; and you see that the noble animals, bedecked like houris, have a half-humorous look in their eyes, that elephants of state assume when little human creatures amuse themselves in a noisy and feeble way. . . . I saw "A Rajah's Birthday" this year at the Whitechapel Art Gallery, where it hung in company with many good pictures that represented the history of British art during the last twenty years; and its triumph was very remarkable. It was alive, while all the other works were paint and skill more or less animated. To pass from canvas to canvas noticing the qualities of each, and seeing their varieties of expert skill, was gentle exercise on a rare hot day, and quite entertaining. But "A Rajah's Birthday" had a very different effect. It was a great surprise. How had such life and colour been achieved? How had the East been summoned to Whitechapel? Why should paint have organic life in this one picture only? Across the hall was a fine canvas by the late Mr. C. W. Furse; it represented a great team of cart-horses splashed with sunlight, and pulling with all their might at a low wagon laden with timber. They moved over uneven ground, and behind them a bank of yellow sand glittered with spangled lights and shadows. I turned from this picture to Brangwyn's, again and again, marvelling at the difference between them. They might represent British art anywhere and win admiration. 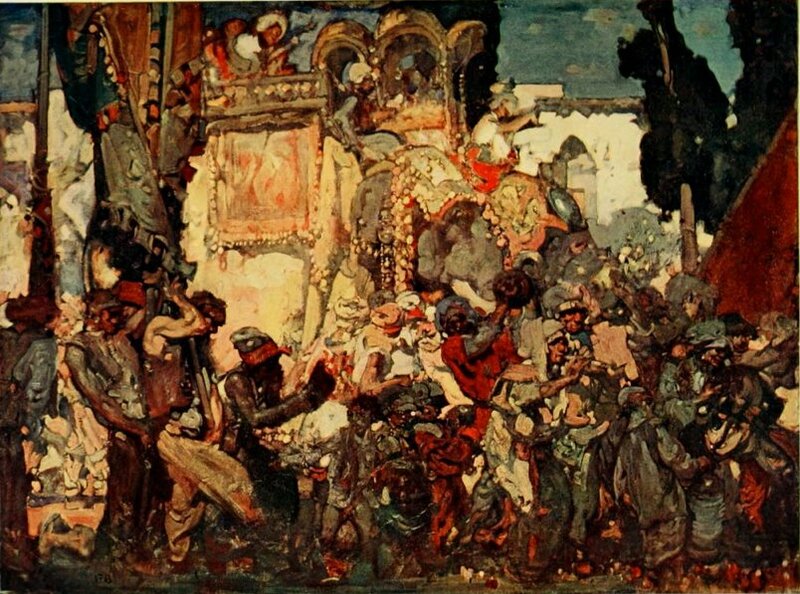 But Furse, despite his great talent, despite his keen observation, despite his subtleness of handling, had accomplished much less than Brangwyn, though Brangwyn had worked at a heat without pausing to consider whether this or that detail might be considered unintelligible. For one thing, Furse had missed truth of impression in the most essential part of his subject. The wheels of his wagon were wrong in weight and strength; they could not possibly bear the immense strain put upon them by four powerful horses hauling a dead weight of timber along a gully of sand. And no sooner did this mistake become evident, than the whole picture became unsteady on those ill-felt wheels. On the other hand, Brangwyn's impressionism was balanced and complete. It had the right proportion of action and quietness; and there was no break in the nervous energy of its handling, though some parts are more felicitous than others. . . .
ONE thing in "A Rajah's Birthday" is particularly interesting; it is the fact that light and glowing colour are found in it together — not by any means a common thing in pictures. One might suppose that because every tint in nature is simply an irradiation of light, composed of the same elements as the sun's rays, a sensation of luminous air would be attained inevitably in paint by truthful values, or by using the seven tints of the spectrum in spots of colour juxtaposed, leaving their individual rays of light to blend when we look towards them at a certain distance; and yet, somehow, anyhow, that blending often produces sunny colour without the spaciousness of air. In other words, light and colour very often are antagonistic to each other in painting. When you attain both at the same time, it is an inspiration, like music.